Very excited today, as my self-imposed "launch date" has arrived! The official launch of my efforts to build a better mousetrap--in this case a production lighting instrument. Two years of development, applying for a patent, 3D printing prototypes. Making mistakes, do-overs, learning new skills......and I'm ready! Introducing the "CL360," a specialized lighting instrument for the emerging markets of 360 degree video, photography and VR/AR production. What has been absent in this new world of 360 content is an easy and efficient way to light the entire scene. Lighting either has to be hidden in plain sight, just expected that it will be seen, or simply not dealt with, using only ambient lighting. My creation solves this problem by providing an even light source that illuminates the full view of the 360 camera, while being "invisible" to it. Accomplished by a now Patent Pending design. The design allows for quick setup suitable for many applications such as video conferencing, interviews, documentaries, real estate, etc. I plan on using this blog space to discuss specific examples and applications for the product. In the meantime, please visit the landing page at http://cameralight360.com which also features a demonstration video. Also, if you happen to be attending NAB next month, I will be there with the prototypes! I will be arranging one-on-one demonstrations with meeting space at The Embassy Suites-Convention Center April 10 & 11. Details on the website. Looking forward to posting more about this device, and how it can contribute to this new world of producing 360 content! 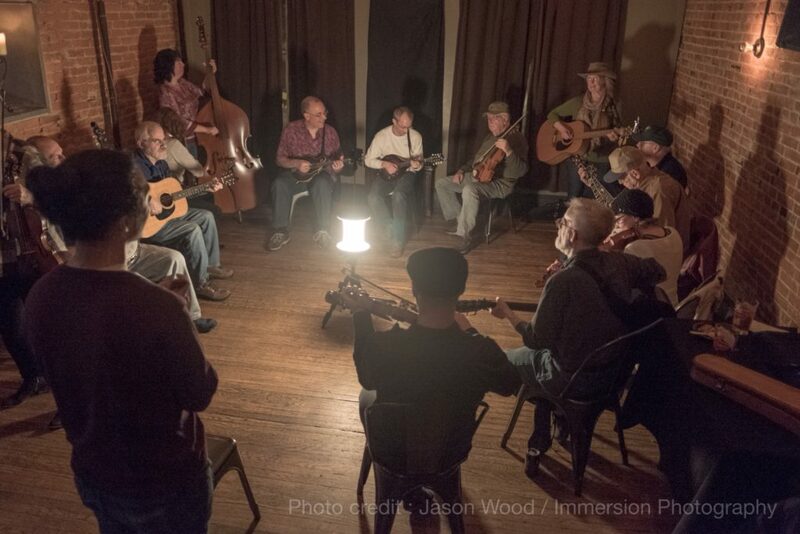 Main photo: the CL360 Video light in use to record a Bluegrass band. Thanks to The Doylestown Jam, of Bucks County, PA.
Photo credit: Jason Wood/Immersion Photography.